Millets are healthy alternative for polished white Rice. Foxtail millet( Thinai/Thenai-Tamil, Korra-Telugu, Navane-Kannada, Kangni-Hindi, Thina-Malayalam) one of the millet variety which is rich in dietary fibre, protein and low in fat. Also this millet is highly recommended to those people having diabetes as it releases glucose steadily. Earlier this was one among the staple food, when Rice started dominating these millets (siruthaniyangal) slowly started losing its importance. Do you know why its name is called FOXTAIL MILLET????????? because the seed part of this crop is dense and hairy and looks like a tail of a fox. Interesting isnt it??? Another interesting fact is that this food crop grows fast in a short period. 1) Mix wheat flour, foxtail millet flour, rice flour, sooji, curry leaves, Asafoetida and Salt in a bowl with enough water and no lumps. This mixture should be little watery consistency. 2) Let it rest for 3- 4 hours. 3) Now add all veggies, corrinder leaves, cumin seeds, pepper and mix well. 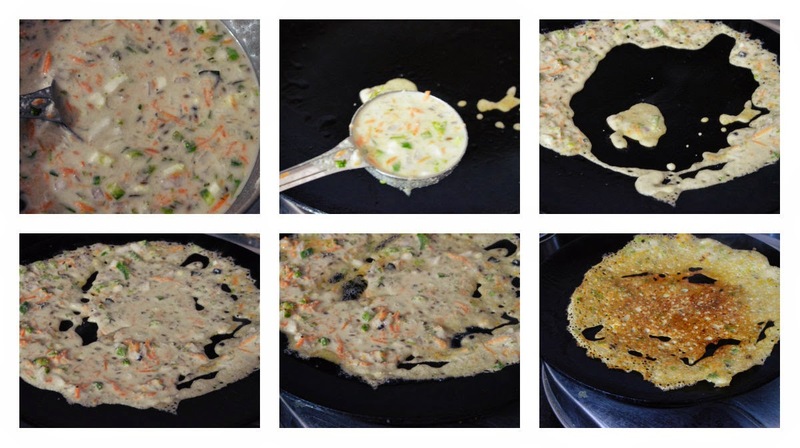 4) Heat a dosa tawa and drizzle some oil and spread well. Pour a laddle of batter forming a outer ring then fill in the gap. 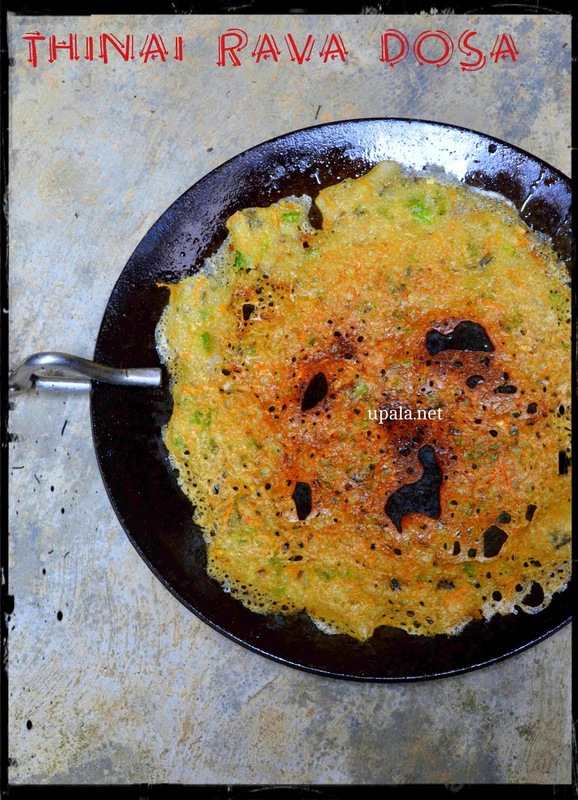 Unlike regular dosa it can not be spread like an even circle. 6) Flip it around to cook the top portion after the bottom portion is done. 2) You can also add chopped onions and skip all other veggies. Also alter the veggies according to your taste.